Bob Feist, internationally recognized opera and symphony conductor died peacefully on August 1 at the age of 89 after a long convalescence at European Senior Care in West Seattle. A memorial service is scheduled for 1:00 PM on August 31 at the Chapel of St. James Cathedral in Seattle. Private burial will be at Holyrood Catholic Cemetery. Mr. Feist was born in Cincinnati on December 4, 1928. He earned his music degrees at the Cincinnati Conservatory and Indiana University. After two years of service with the U.S. Army in Richland, Washington, he won a Fulbright fellowship and went to Rome with other music fellows – including soprano Anna Moffo, who became a lifelong friend. 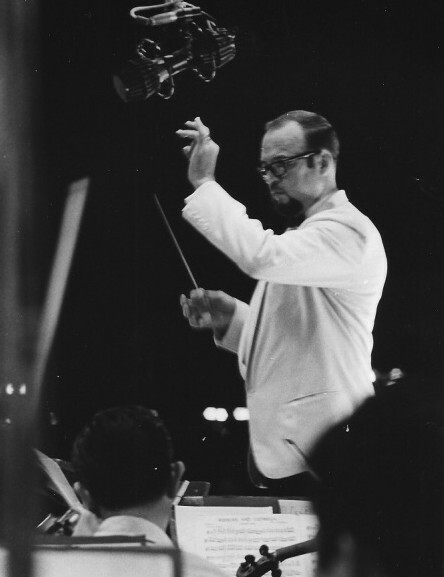 Mr. Feist made his conducting debut with the Rome Opera House Orchestra in 1955, at a Spoleto concert featuring Moffo and other Fulbright fellows in a selection of opera arias and duets. “But I have never conducted,” Feist replied. “Well, you will now,” came the reply. His chief mentors on the conductor’s podium included Gui, Gavazzeni, Santini and Serafin, plus others at Bayreuth in Germany, where he studied at the invitation of Wolfgang Wagner. Feist went on to lead many of the world’s major orchestras on four continents, chiefly in Italy and Germany. He also took long sojourns in France, Russia and Czechoslovakia and made 10 tours to the Far East, Middle East, Australia and New Zealand. Prominent venues included the Teatro San Carlos in Naples, L’Accademia di Santa Cecilia in Rome, the Teatro Comunale/Maggio Musicale in Florence, the RAI orchestras of Milan and Turin, L’Arena di Verona, as well as others in Milan, Palermo, Trieste, Spoleto (Festival of Two Worlds), San Remo, the Munich Philharmonic and Augsburg Philharmonic, L'Orchestre de la Suisse Romande in Geneva, the Swiss-Italian Radio Orchestra in Lugano, the Netherlands Radio Orchestra, the Seoul Philharmonic, the Manila Symphony and the Australian and New Zealand Operas. Feist made his U.S. debut in New Orleans with the opera Tosca, followed by performances in Cincinnati as well as Miami, Chicago and St. Petersburg, Florida. Starting in 1981, he spent seven years in Seattle as director of the University of Washington Opera and Symphony Orchestras and head of graduate studies. His career also included directorial posts in California for the Festival at Lake Tahoe, the Oakland Opera, the New Oakland East Bay Symphony, the Marin Civic Light Opera and Opera Peninsula in San Mateo. In Portland, Oregon, Bob produced the Rossini Bicentennial Festival and conducted master classes at several Oregon universities. He then returned to Seattle, where he was a consultant and vocal coach for singers pursuing opera careers. Mr. Feist wrote and narrated more than 100 broadcasts on operatic themes for National Public Radio, including Exploring Opera, Orchestras of the Pacific, and Winds of the East. He also wrote the script for a German television special on the life of Giuseppe Verdi and assisted with the filming. In addition to the standard repertoire, Mr. Feist pioneered contemporary works in concert, a list of more than 100 regional premieres conducted throughout the world, and more than 50 operas of all eras from Handel and Mozart to the 20th century. His specialty was the Italian repertoire from Rossini to Puccini. Mr. Feist conducted seven West Coast or Northwest premieres at the University of Washington, plus the U.S. premiere of Bohuslav Martinu’s Julietta in 1988. He served as a judge or host of the Metropolitan Opera and San Francisco Opera regional auditions, as a panelist for national conferences of the Metropolitan Central Opera Service and the American Symphony Orchestra League, and as a teacher of master classes throughout the U.S.
A skilled collaborator, Mr. Feist made many friends among the singers and conductors he met. He told their stories as well as his own in his 2010 memoir, The Last Great Era of Opera: The 1940s Through the 1970s. Mr. Feist was preceded in death by his parents, Robert Valentine Feist and Mary Hautman Feist. He is survived by friends who mourn his passing.